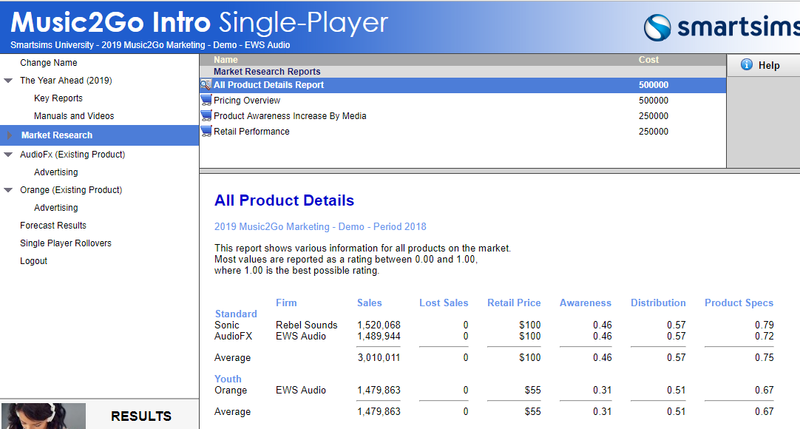 In Music2Go you make decisions for an entire year, but your factory has a limited ability to adjust the number of units produced to try to meet actual demand during the year. This is called Demand Responsiveness. Demand Responsiveness allows the actual number of units ordered to increase or decrease by up to 20% to meet the actual demand for your product. 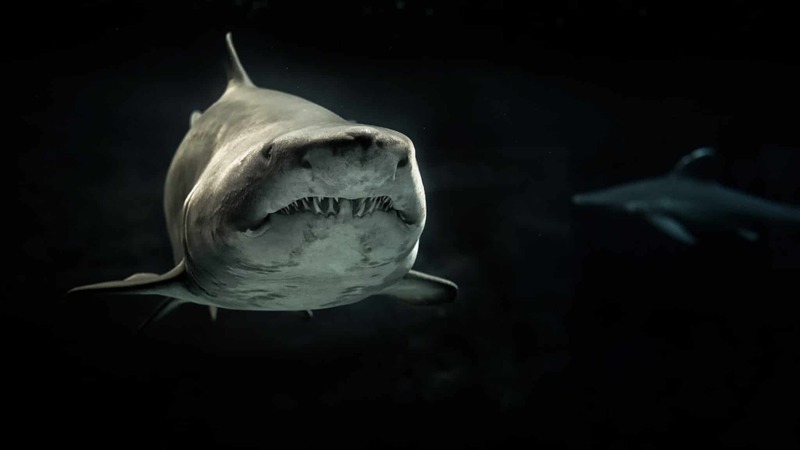 For instance, if you ordered 1 million units of a product, then the actual number of units delivered could vary between 800,000 units and 1.2 million units depending on actual demand. 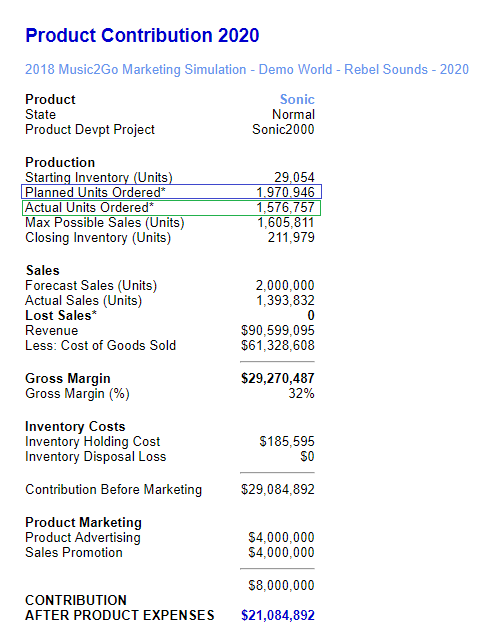 In our example above, we ordered 1.9 million units of our Sonic product, but the Actual Units ordered was less than this at 1.5 million because the demand for our products was less than what we anticipated to sell. Note: Most worlds have 20% Demand Responsiveness enabled, although your instructor may request this to be modified or disabled for your Multi-Player. 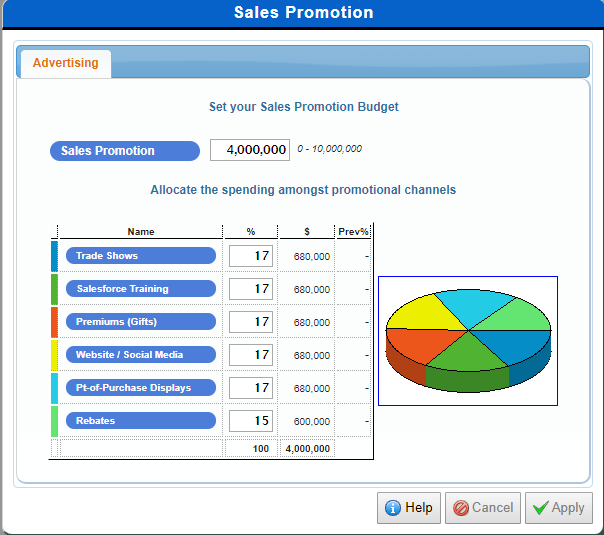 Question of the Week: What is Sales Promotion? 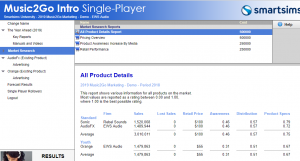 Sales Promotion in Music2Go works by boosting your distribution coverage and distribution index. You should buy the Distribution Coverage and Sales Promotion Market Research report for detailed information on the Sales Promotion Rating and stage of Product Life Cycle for all firms in the Industry. Each promotional activity has particular relevance to certain stages of the Product Life Cycle as outlined below. Note that the Distribution Coverage and Sales Promotion Market Research report will show the age and stage of product life cycle for every product on the market, as well as the Sales Promotion Rating and the Promotion Mix effectiveness. Remember that each of your products will progress through the Product Life Cycle starting in the Growth phase for new products, then gradually progressing through to the Decline stage over the next six rollovers. Life Cycle for all firms in the Industry. How much competition is there in this market segment? How are my competitors pricing their products in this market segment? How sensitive is this market segment to price? What are the minimum and maximum price levels for this market? Note: We recommend staying away from the top 5%-10% of the price range for every market segment, even for price insensitive segments. The maximum price is the level beyond which NO consumers will buy your products. So even for price insensitive segments, a product that is priced at the maximum looks like poor value compared to a more reasonably priced product. Similarly do not price too close to the minimum price level for a given market. The extra market share is unlikely to make up for your smaller margins. Start off somewhere in the upper-middle of the price range and work your way up or down from there. What is my overall strategy? What are my projected sales for a given pricing level and advertising mix? Once you set your price, consider your retailer margin, unit cost, unit margin and sales projections. Look carefully at your Forecast Results reports and your Forecast Net Marketing Contribution report. If your sales projections are accurate, will you make sufficient gross margin to give you a positive Net Marketing Contribution? Is it worth giving your Distributors more Retail Margin early in the simulation to encourage them to stock your products and gain market share? Or do you already have sufficient market share and distribution that you can afford to cut your Retail Margins? It is crucial that your Product Strategy follow the preferences of your consumers. Valuable Market Research has been conducted to investigate what your customers are looking for in the products they buy. This information is available to you under the Market Information Report (under the Key Reports menu). 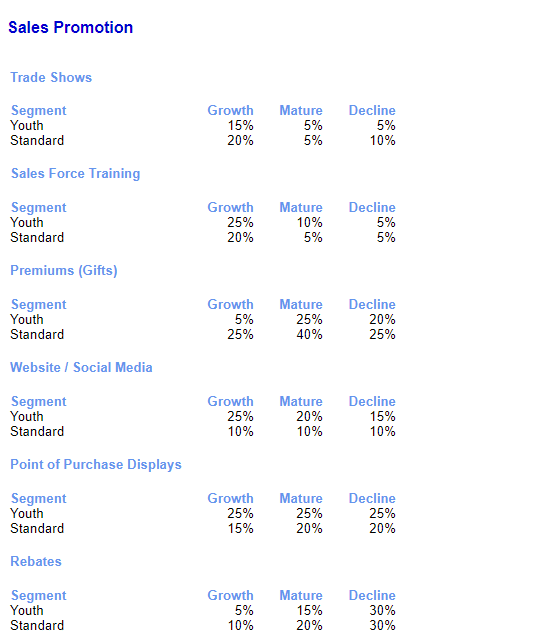 The table above (taken from the Market Information Report) will tell you important areas that you should be focusing on. For example, the Mountain Segment has High sensitivity to Advertising. 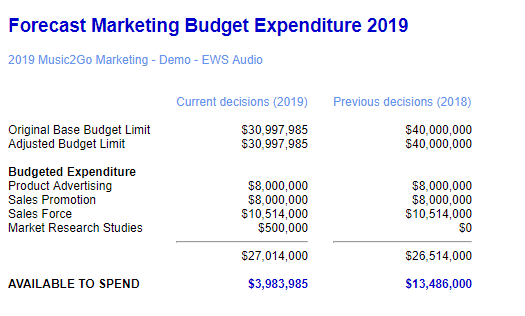 What this means is you should be focusing your Marketing Budget on Advertising and not PR (as the Mountain segment has low sensitivity in this area). If a market segment is highly sensitive to one area this means: “if you increase this figure, then proportionately more people are going to buy your bike.” This would then result in a higher return on your investment than if you invest in areas where your target market segment has a low sensitivity in. Each market segment is sensitive to different dimensions. View the Market Segment Scenario Information report. If we take the Racers segment we see it has a low sensitivity to Advertising and a high sensitivity to PR. This means that an increase to our Racers bikes’ PR index (see Market Summary report) is going to have a larger increase to our sales volume than a change to our Awareness rating. Your Retail Price is the dollar price you direct distributors (Bike Shops) to sell your products to customers. The distributor receives a percentage of the Retail Price (known as Retail Margin) and you receive the remaining amount (known as Wholesale Price). Retail Price is usually a key determinant of Consumer Demand and is critical to maximizing your Sales Revenue and Profit. Therefore, carefully thinking about your pricing strategy is important to your company’s overall success! Your Retail Price should not be set without regard for the price sensitivity of consumers (see Market Information Report) and the prices of your competitor’s products (see Market Summary Report). Your Retail Price must also align with the overall marketing and company strategy. For example a Low Retail Price would require a High Volume of Unit Sales, as such, you would need to consider how this would impact marketing expenditure and operations decisions (i.e. Factory Capacity and Efficiency).